Every generation of gamer talks wistfully about the days gone by, when games where better, harder, more clever, or any other variation of something that ends in -er. Then there’s the opposite camp that will tell you your memories are being seen through dusty old glasses, and you’ve purged your mind of things that are just bad game design in favor of the happy memories. It’s a concern that comes up again and again as old games are remastered and refreshed for a modern audience. Is it best left in the past, or does it have a place in today’s gaming economy? Can it stand on more than the nostalgia of fans? The Crash Bandicoot N. Sane Trilogy collects Crash Bandicoot, Crash Bandicoot 2: Cortex Strikes Back, and Crash Bandicoot 3; Warped, though collects is too tame a term. Rebuilt on the framework of the originals, designed to fit with modern games, even the term remaster doesn’t do these games justice. The N. Sane Trilogy is a pixel perfect remake, looking better in every way, but playing and feeling just like those games did when they first released. There are some changes, like allowing for analog stick control, but these small changes and updates feel right at home, so there’s no clear line between what was part of the originals and what’s been added for this collection. It’s all developed in such a way as to feel seamless and cohesive. Each of the three games launches from a single trilogy menu, but each has been given its own trophy list and Platinum trophy. That’s right, Crash has three Platinums if you want to test your mettle against all of the collectibles and time trials scattered through each. Time trials are another thing that unifies the collection, along with the same loading, game over, and menu screens, all making the N. Sane Trilogy feel like a single package rather than a disparate collection of three different games. The first two games actually didn’t have time trials before, and these changes are implemented in such a way that you’ll wonder if your memory is failing you or if the originals did actually have time trials and analog stick controls. Nostalgia hit me as I played through each one, but the real emotional feeling came when I played the third game in the collection, Crash Bandicoot: Warped. Warped was a game that 10-year old me played again and again. For years I played and replayed, collecting the crystals and gems, completing the time trials, learning the game inside and out. The moment I loaded up Warped in this collection for the first time, I was transported nearly two decades back in time. Every level, every crate, every bonus area — nothing was out of place, but it all just looked like a modern game. I haven’t played Crash Bandicoot: Warped in about 15 years but it was like muscle memory. Everything came back to me and I managed to complete the first five levels and the boss without dying, collecting every box along the way, and with the perfectly updated visuals, I never felt like I was playing a 20 year old game. The funny thing about nostalgia is that it can color your perception, maybe remembering a certain gameplay peculiarity as better than it is due to a decades old fondness. 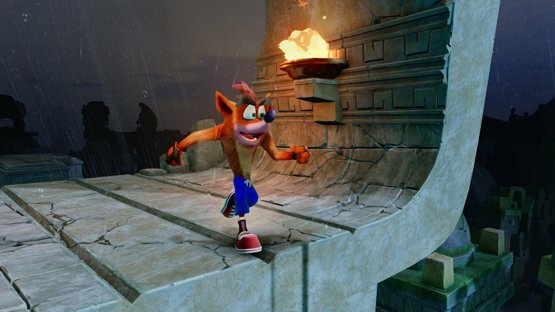 We’ve had 20 years of improvements to gaming, so in some way Crash must be stuck in the past, right? 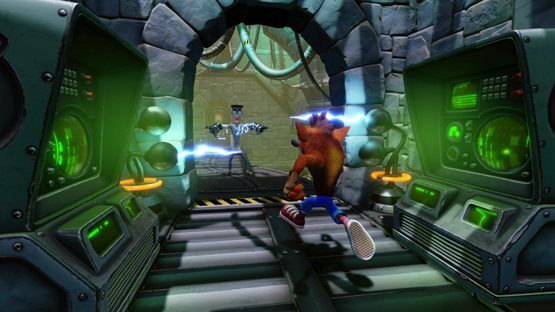 It would be easy to say that Crash’s difficulty, most notably the first game, is due to the ancient machinations of poor game design that we’ve improved on, but I don’t think that’s it, at least not in most cases. Crash Bandicoot is exceptionally difficult in some areas, but that’s because it’s a precision platformer, one that doesn’t hold your hand or make things too easy. Crash will test your skills and pattern recognition to get through many of the levels, not to mention doing it fast enough to earn that platinum ankh in the time trials. I do wish that the N. Sane Trilogy did more to help with depth perception, as spatial positioning of platforms, enemies, and pitfalls can get occasionally be difficult to properly judge. It’s rough when a perfect run is cut short because you misread the location of board on a bridge, and end up falling to your death for the final time, resulting in Uka Uka delivering one of the most sinister “Game Over!” lines in gaming. Along these same lines, while many hitboxes are improved to not be as unfairly punishing (those annoying pterodactyls in Warped aren’t quite as difficult to dodge as they once were), some of them are still difficult to judge properly. There were a few deaths that I felt came from not being able to fairly assess what part of the enemy or dangerous object would be the thing to kill me, and kill me they did. There’s a fair balance of design pitfalls and legitimately difficult platforming across all three Crash Bandicoot games collected in the N. Sane Trilogy. It gets noticeably easier as the series moves forward, probably due to some very tight platforming choices being solved as Naughty Dog originally evolved the games. On the one hand, it’s commendable that Vicarious Visions didn’t touch the original at all, leaving those difficult jumps just as tough as they were, or avoiding any changes to Coco’s jetski physics in the third game. On the other, this was the prime opportunity to fix some of these original mistakes that Naughty Dog made when the games first released. I fall in the purist camp, the group of people that appreciate the authenticity of the originals being left intact, frustrations and all, but if you’d prefer to have seen some major changes to pieces you felt were badly designed, you won’t find them here. 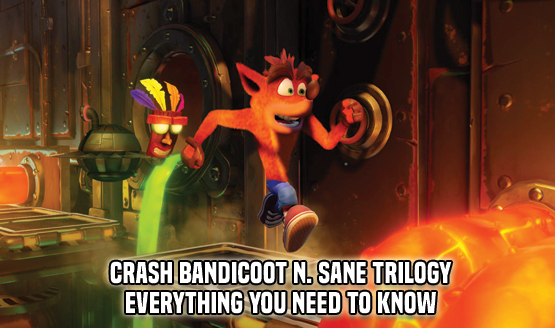 The Crash Bandicoot N. Sane Trilogy was clearly developed with a love and passion for those original games. The updated graphics are a beautiful sight to behold, even if you aren’t using a PS4 Pro, and yet these are the same quirky platformers that we came to love and be frustrated with in the ’90s. Some of the original design idiosyncrasies are still in place, but the majority of memories made with Crash are good ones, and I never want them to change. Significant replayability and an excellent entry price point make the Crash Bandicoot N. Sane Trilogy a benchmark for how future classic game remakes should be handled, the originals left intact, imperfections and all. Crash Bandicoot N Sane Trilogy review code provided by publisher. Reviewed on standard PS4. For more information on scoring read our Review Policy.